One possible reason U.S. gasoline demand has nearly flatlined in recent months is the increasing number of electric and hybrid vehicles on the road. Despite the fact that gasoline prices remain relatively low, it seems each day brings new deliveries of a new electric vehicle. Last week it was the much-hyped Tesla Model 3. This week it's Honda's new electric, the Clarity. Honda has begun delivering the 2017 Clarity sedan at select dealerships in Oregon and California, with an introductory lease costing $269 a month for 36 months. Honda says that price reflects the federal tax credit and requires a little over $2,000 at signing. It's a fairly low-mileage lease, however, limited to just 20,000 miles per year. 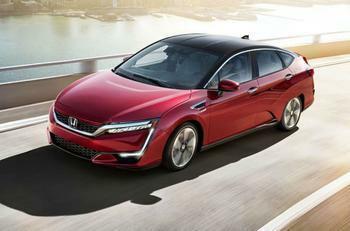 Honda says the Clarity sedan runs on a 161-horsepower electric motor producing 221 pounds per foot of torque, drawing power from a 25.5 killowatt lithium-ion battery pack. The company says the car can be fully charged in just over three hours at 240 volts. Using the SAE Combined Charging System, it can rev up to an 80% charge in just 30 minutes. The car has an EPA fuel economy rating of 126/103/114 MPGe (city/highway/combined) and has a range of 89 miles on a full charge. Honda plans to have a series of alternative-fueled Clarity models. The Clarity Fuel Cell came out last December and the Clarity Plug-in Hybrid will launch before the end of this year. Sales figures suggest electric vehicles have finally captured consumers' attention, at least on a global basis. After being non-existent for years, the International Energy Agency reported that new registrations of electric cars hit a record last year, with over 750,000 sold worldwide. Previously, it was thought low gasoline prices were putting a damper on sales. The ATP for hybrid and alternative energy cars also declined in July, but not nearly as much. KBB shows the year-over-year decline of 0.2%, at $26,034.